I'd wanted a swingy striped dress for the longest time, and I found this little number at Asos (oh, and it's currently on sale). I've vented about this before, but I have the hardest time finding skirts and dresses of a reasonable length that don't look frumpy on me. I'm 23 and want to look fun and young, but I also don't want to have to be paranoid all day long! So, I was so excited that this one was a great length, and that it's seriously so comfy - score! I wore it dressed down Monday evening with sandals and a fun necklace for dinner and shopping with my bestie (shoutout to Haley for snapping pics for me! ), but have also dressed it up with wedges and dressier jewelry for work. 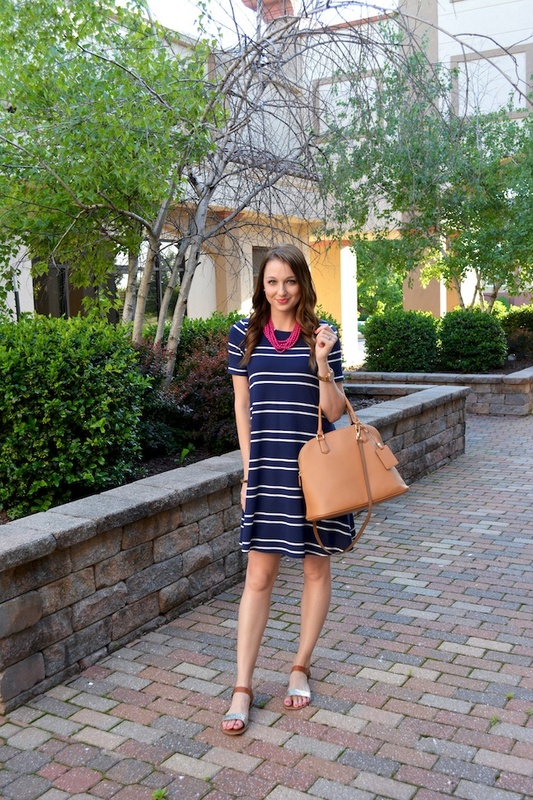 I love the movement this dress has–it looks like it's the perfect breezy summer staple! That little swing dress is so cute, I want one so badly. Hey girl, hey!!! This is such an easy breezy look....spring and summer perfection!!! I agree with Shanna, this is totally spring perfection! Great, casual look! I love the sandals. I have a pair just like them. I love this casual dress. Especially with those two-toned shoes you paired it with! Very cute! Such a cute swing dress Jacy!